Apparently HTC has found the breakthrough of the last 5 years for Verizon and yet they want everyone to remain silent on the matter. But why keep it a secret? We can’t help but toss this out there…can anyone think of one major reason as to why Verizon wouldn’t want their sales staff out on the floor announcing that the Thunderbolt can do voice and data at the same time? This is HUGE news if you think about it. AT&T constructed an entire ad campaign about their network’s voice/data capabilities in comparison to Verizon’s. And now they’ve figured it out, but want to keep it a secret? I wonder if it has anything to do with that other phone that comes out on February 10th and the fact that it is unable to perform such a task. Can you imagine all the i*hone users returning to VZW stores asking why that “DROID” phone can do something theirs can’t? Epic. 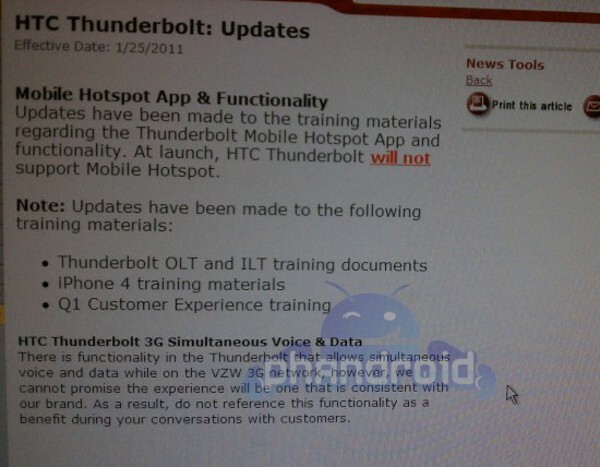 So…who’s changed their mind and now wants a Thunderbolt?